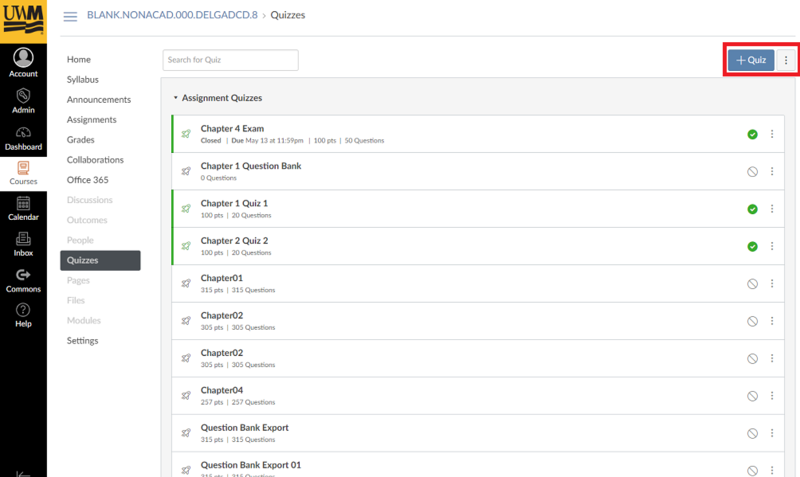 This article lists the steps to importing a quiz or question bank from Canvas into a Respondus project file. Respondus cannot export quizzes and question libraries from Canvas. To export a question bank, a temporary quiz is used. 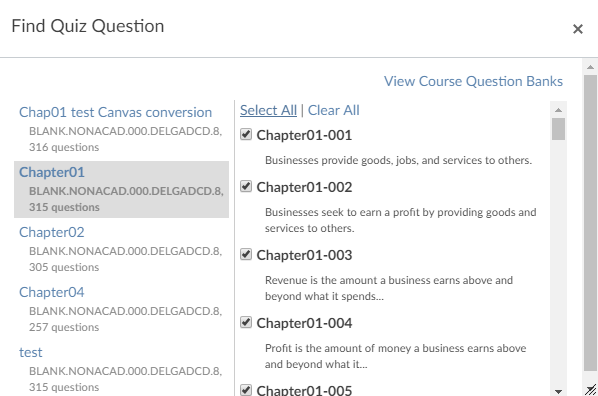 Create a temporary quiz containing all the questions you would like to include from your course question banks for your export. Login to Canvas with a UWM ePanther ID and password and navigate to the course that has the question bank for the export. Select Quizzes from the navigation menu. Name the quiz after the question bank that is being exported (i.e. Chapter01 Question Bank). Next to the Details tab select the Questions tab. Select the question bank in the pop-up window and scroll through the question list to select all the questions for the export. Once all the questions for the export have been chosen, select Add Questions. Save the quiz but do not publish it. The quiz can be deleted after the export has been completed. In the course, select Settings from the navigation menu. On the right side of the screen, select Export Course Content. Under Export Type, select the Quiz button. 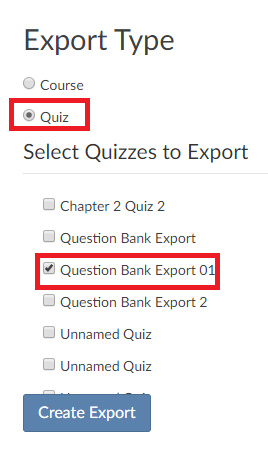 Under Select Quizzes to Export, select the quiz that has been turned into a question bank. The next page titled Content Exports will show a blue progress bar for the export. An email will be sent to the UWM email address associated with the account with a link to download the export .zip file. Reload the Content Exports page for a link to download the .zip file at the top of the page. Open up the Respondus 4 application. Under Current Personality, select IMS QTI from the drop-down menu. Select Import Questions from the Open and Create menu. Next to File name select Browse. On the bottom right of your file browser, change the file type from the drop-down menu to Zipped IMS QTI package (.zip). Select the file recently exported from Canvas. Name the new Respondus 4 document. Check Use Stem if Respondus 4 should number the questions in a certain way. Select the Preview button to make sure there are no problems with the questions and to determine if the questions will import properly. Select Finish upon reviewing the preview.